I’ve attached a picture of my driveshaft with the Jeep sitting on the ground and it looks way too short. Since this YJ is a bitsa at best I’m not too surprised...it drives and rides well, but this can’t be the right shaft. Thoughts? 93 Wrangler YJ, 4.0, 5 speed...running, driving and the kids and grandkids are having a ball! If you want a longer driveshaft, get a super short slip yoke eliminator. The 4th 5-seater YJ in the world. Looks stock to me too. By the looks of things, you may want to check to see what the transfer case fluid level is at & top-off or change it as necessary. There's a good chance the slip yoke seal and possibly bushing is bad causing the leak & fluid being thrown on the tub & dripping. Easy enough fix though. also worrisome colour to that oil. The seal and bushing need replacing along with all the fluids. What do you mean by red? He means ATF is red and that's what should be in the t-case. 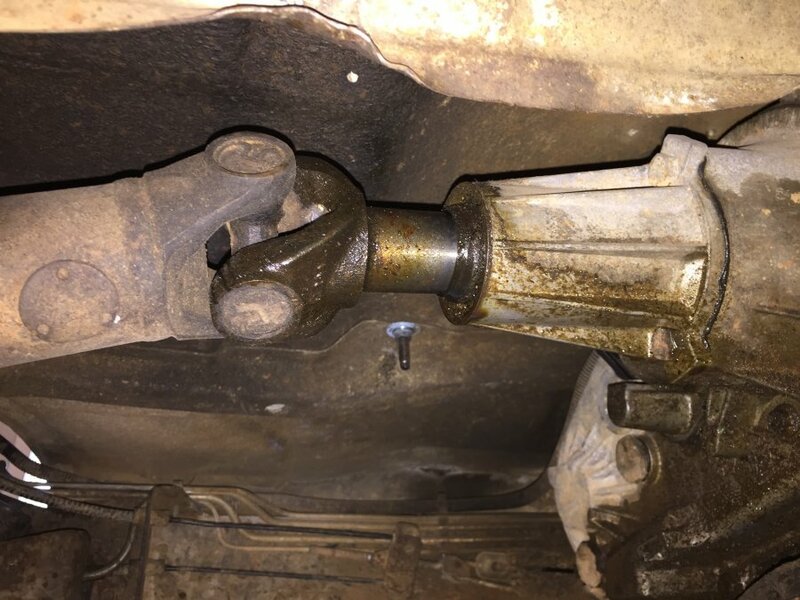 I agree, looks completely normal as far as a stock driveshaft looks. Thanks again! It looks and smells like GL5 to me and I’ll drain everything and replace it with the proper lube. Any particular brands of ATF and lube for the TC and diffs? I don't use any particular brand, just normal gear oil for the diffs and ATF+4 for the t-case (well that's what I used when I had stock stuff) I use Redline MT90 in the AX15.